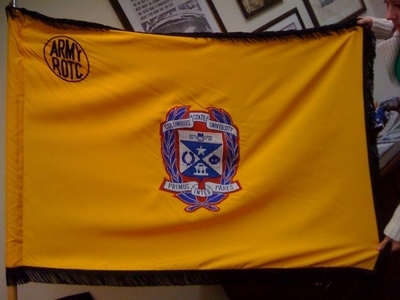 These official U.S. Army Senior ROTC organizational flags are made to Army regulations (AR-840) and meet US heraldry specifications. They feature a fully embroidered design sewn onto luxurious rayon fabric and are finished with a pole hem and fringe. These flags offer the fullest visual effect for display and are made for indoor display. The flag is yellow with a black fringe. In the upper hoist is the monogram �ARMY ROTC� in black on a yellow disc edged in black, 6 1/2 inches in diameter. The seal or device of the SROTC organization, 16 inches in height or diameter, is centered on the flag. All material and labor are USA derived. When ordering, please provide unit information in the Text box provided. Once order is placed, please provide a picture or the drawings of your school seal via email at sales@guidonsandmore.com.